Some exciting news has found its way across the pond, across the European continent and through the spotty Ukrainian internet connections I’ve been using to stay afloat in the internet world. 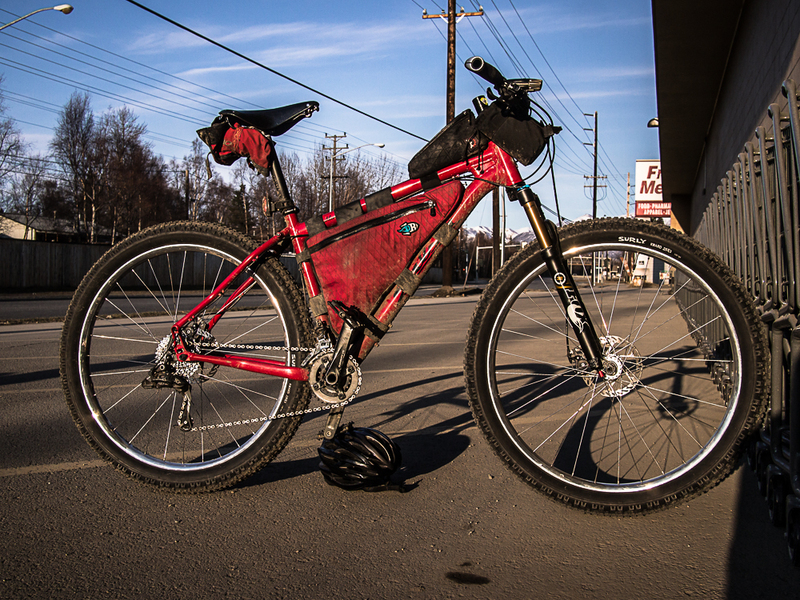 The most recent issue of Bicycle Times features an article about my year touring and commuting on a Surly Pugsley fatbike, entitled “One Bike For All Seasons”. Check it out in print at your local press stand, or from one of these digital sources. The cover art by Kyle Stecker is worth the cover price itself– well done! I’ve been a fan of Bicycle Times since I first spotted pages full of practical bikes and DIY advice. Their acceptance of fatbikes into the realm of the practical is much appreciated, and is a strong signal of the changing bicycle times we live in. In other news, I’ve heard rumors of an aggressive 29×3.0″ Dirt Wizard tire for Surly Krampus and ECR frames. This tire, first designed in a 26″ model for the re-issued Instigator frame, greatly enhances my interest in the 29+ format, as I’ve grown accustomed to more aggressive tires such as 2.4″ Maxxis Ardent and 2.35″ Schwalbe Hans Dampf. A Krampus or ECR with such a tire might hit a sweet spot between my Pugsley and the current 29″ set-up on the Raleigh XXIX. Ukrainian update: We are enjoying our time on the Crimean Peninsula, in a magical climate between mountains and sea that harbors vineyards, ancient cave cities, Cold War-era bunkers, and a melange of culinary delights from Russia, Ukraine, Turkey, and beyond. This is a special place, and the riding has been no less than stunning, while a history of hiking in the region means dirt roads and trails are accessible, and navigable. I hope to share more words and images soon– in the meantime, we’ll be enjoying our last week in Ukraine before flying back to the US on Oct. 1, to Denver, via Moscow and NYC. Note, the Russian airline Aeroflot operates inexpensive flights from JFK in NYC to Kiev and Simferapol, Ukraine, with no surcharge for packed bicycles. So, we’ll be in Denver on Wednesday Oct. 2nd. We plan several days in the area to rest, write, and repair our bikes and equipment before embarking on two months of late-season riding in the SW. The approximate plan is to tie up some loose ends– remnants from last summer’s dreams. Roughly, we hope to begin riding near Grand Junction and Fuita toward Moab via the popular Kokopelli Trail (exploring trails near each end of the route), then south through the Canyonlands region of Utah, to connect with the Arizona Trail. Eventually, we still plan to spend the winter in Alaska. There are fatbikes in our future, once again. Anyone in the Denver/Fort Collins/Boulder area want to meet for a ride or a beer? Anyone know of a good way to get nearer to Grand Junction from Denver? We might ride part of the way if skies are clear, although our sights are set on riding into Utah sooner than later, as changing seasons prescribe. Anyone want to ride the first leg towards Moab, sometime in the first week or two of October? Keep in touch.